We are engaged in providing different types of Coupler Plates, which are also known as steel coupler plates or upper coupler plates. Several types of plate interfaces can be coupled using these plates. Customization of these plates are also possible at our end, which helps us in attaining maximum clients satisfaction. We are a reputed company involved in supply of precision engineered Coupler Plates. These are manufactured using high grade raw material and cutting edge technology. 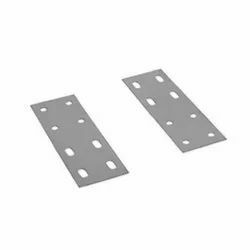 These are also known as upper coupler plates and steel coupler plates and are used for diverse applications to couple different plate interfaces. These can be customized as per the exact requirements of our clients. We are engaged in offering to our customer a wide range of Tee Coupler Plate. Dimension: As per customers requirements. Surface Type: As per customers requirements. Color: As per customers requirements. Riding on vast volumes of expertise in this arena, we are occupied in offering Coupler Plates. We are listed to be one of the noteworthy names for this impeccable selection of Coupler Plate at very affordable rates. EVERSHINE MAKE WIREMESH CABLE TRAY COUPLER ( jointer) IS AVAILABLE IN SS 304 and GI materials. It is ready stock.